One of the most common questions I’m asked is what my self care routine looks like on a daily basis. My daily self care routine is nothing too fancy or crazy, but it’s the practice I call on each and every day to help me feel my best, and allows me to put the best version of myself out in the world for myself and others. Before I share with you my daily routine, let’s talk about the benefits that come along with practicing a daily self care routine of your own. You might be surprised to hear that my self care routine starts before I even wake up. Corbin installed these incredible light bulbs in our lamps that turn on automatically and slowly fade in at whatever time we set. Nixing my loud alarm clock has made the morning wake-up routine much more peaceful and allows me to ease into my day. Note: I really love these lightbulbs, and if you’re interested in getting some, make sure to get the Hub as well so you can pair your lights with your phone and dim on-demand, set alarms, etc. Once I wake up, the very first thing I do is take my temperature with my Daysy thermometer. As a form of major self care, I listened to my body and removed my hormonal IUD, so taking my temperature to detect my fertility status is the very first thing I do in the morning. Not glam, but so necessary. After I’m out of bed, I do some simple stretches to get the kinks out from the night before. Don’t get me wrong, I love our bed, but it feels so good to stretch your muscles each morning. After I’m finished, one of us makes the bed because I’ve found that this simple act of straightening the sheets and fluffing the pillows makes me feel like I’ve really started my day on the right foot. Before I even brush my teeth, I dry brush. 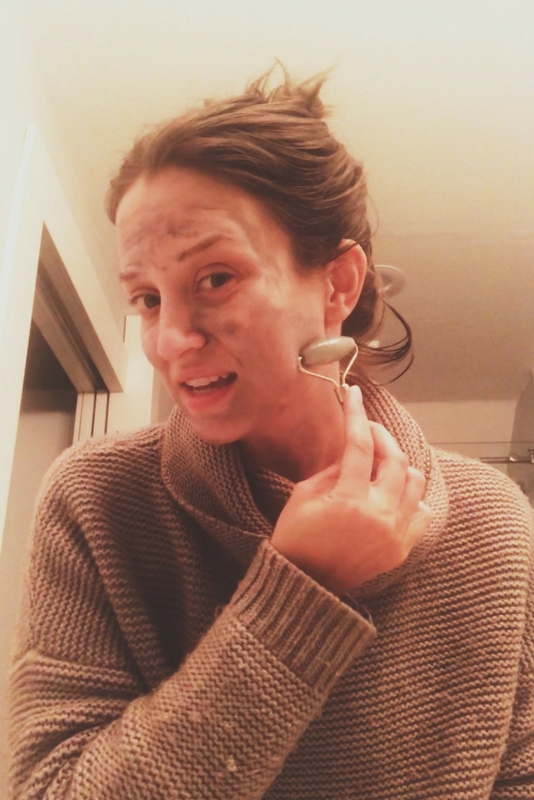 This simple ritual has improved my skin’s texture, appearance, and feels so good. Not to mention, it’s great for draining your lymphatic system and improving overall circulation. Oh, and did I mention that it helps diminish the appearance of cellulite? Yes! My skin care routine is so important to me, and I like to keep mine as natural as possible. Each morning, I roll on my custom rollerball blend and gently massage it into my skin with a jade roller. Benefits to jade rolling include: increased circulation, decreased pore size and fine line appearance, and lymphatic drainage. Note: I am very particular about the essential oils I use and only trust doTERRA, as their oils are third-party tested and are Certified Pure Therapeutic Grade. After my face oil is massaged in, I use doTERRA’s anti-aging eye cream underneath my eyes. This eye cream contains some of the most powerful and potent essential oils like frankincense, blue tansy, and ylang ylang. The coolness of the metal ball applicator helps to energize my eyes and instantly decrease puffiness. I seriously love this part of my morning! I’ve stopped wearing makeup most days, but I do apply a tinted moisturizer with SPF every single day, no matter how rainy it is outside. Working from home is great, but it certainly comes with it’s challenges for staying on-task and focused. To help me ease into my day, I like to start each morning with a clean kitchen, an uplifting diffuser blend, and some fresh air. 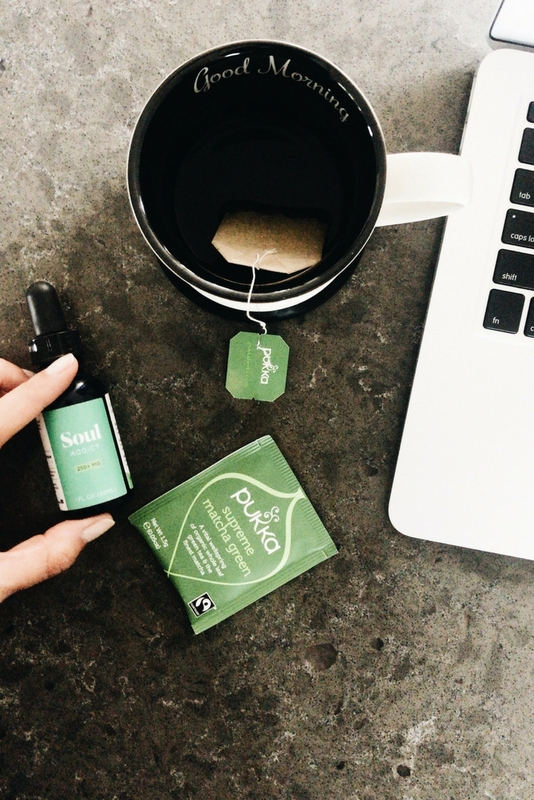 Then, instead of coffee (I quit drinking it two years ago), I make myself a mug of tea and add in Soul Addict’s organic CBD hemp oil (you can save 20% with code SA_carley20). As someone who has experienced anxiety, this small daily ritual has completely changed the way I start my morning. I feel a lot more focused and a lot less flustered. It’s incredible what switching the source of my caffeine has done for my sleep, skin, and overall mood. That dreaded 3 PM crash is finally a thing of the past for me. Another beautifully simple (and completely free) self care practice I’ve started implementing throughout the day is taking pauses and breaks as I need them. Coming from the corporate fashion world, I was constantly chained to my desk or running around like a wild-woman, leaving little time to take a breather. Now, I allow myself to shut down my computer, take a walk outside, or even sneak in a little snooze. My workday has become a lot more flowy and I stopped feeling bad about not eating lunch at my desk. After dinner, I make myself a mug of Sakara Detox Tea to not only help my body’s natural cleansing, but also to distract myself from reaching for something sweet. I used to have a terribly powerful sweet tooth, but I’ve nipped that habit after making some lifestyle changes and cutting it out completely for a period of time. The Sakara Detox Tea keeps my brain busy and helps me stay on track. From there, Corbin and I usually chill out and watch a show or plan our next getaway. When it gets close to bedtime (around 10 PM), I use those handy-dandy lights I mentioned earlier and dim our bedroom lights to a low level so I’m not blinded by bright lights when we go up to get ready for bed. Once upstairs, it only takes me about ten minutes to get ready for bed. I put on my comfiest PJs (I like sleeping in cotton) and let my hair down, literally. Then, it’s time for skincare. First I remove the dirt and dust I’ve collected throughout the day (you’d be surprised what comes off of a “clean” face!) with a Beauty Counter compostable makeup removing wipe. Then, I use my nighttime essential oil rollerball filled with some of the most potent and pure essential oils, followed by a smooth-in with my trusty jade roller. These oils help to encourage cellular regeneration, calm inflammation, and encourage moisture throughout the night. 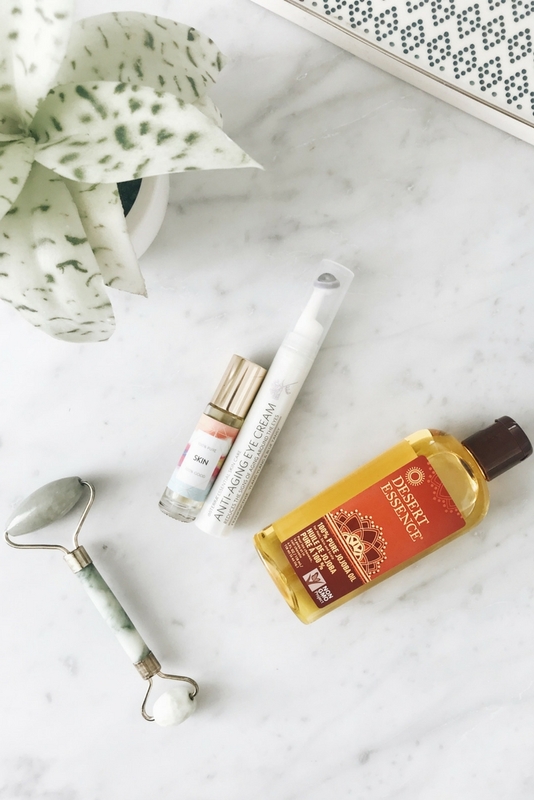 When people ask me what I use they’re usually kind of confused when I tell them it’s simply high-quality essential oils and jojoba oil. Yes, plus a jade roller, lots of water, and targeted treatment for my eyes. Plus I use a Clarisonic once a week to exfoliate and smooth out my skin. Once my oils are smoothed in, I will apply the same oil-infused eye-cream from before and then spritz my entire face and hair with pure rosewater. There’s something so refreshing about that little moment of rejuvenation before I tuck in for the evening. And it’s so simple, right? I do the other fun and exciting things like brush my teeth and tongue scrape (before you say it, I’m the worst flosser and it’s a habit I’m working on picking up…) and then it’s time for sleep. Before climbing into bed, I spray our linens with a homemade sleep spray to help my body really know it’s time for bed. Scent is such a powerful tool and can really trigger a response – either positive or negative – within our bodies. So, for me, using the same oil blend each and every night reminds my body that it’s time to rest. The moment I’m in bed, I make it a point not to check my phone. It lays face down on the other side of my nightstand on silent. Corbin and I have a strict no-phones-in-bed rule that we really try our best to keep. We also don’t have a TV in our bedroom, so we tend to fall asleep in about 2 minutes after our heads hit the pillow. As you can see, my days are relatively simple, but what’s important is that they begin and end each day with the same routine. One that allows me to stay sane and feeling my best. Are you inspired to switch up your daily self care routine? Share below!